Water Chillers. Sparkling Water Chillers. Water Coolers. Multiple models and configurations available. The Refresh GPLUS 20 is a high capacity still and sparkling water chiller. Can be located on the counter or undercounter. Specially designed system allows this cooler to function perfectly even in the extreme temperature conditions of up to 43 degrees celcius! The Refresh U260 is a powerful undercounter water chiller with a Silver Turbo Cooling System. THE FASTEST COOLING SYSTEM, taking just 3 minutes to cool its output water. 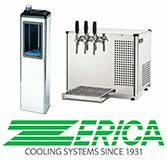 Suitable for large households, offices, small bars, restaurants and cafeterias dispensing water by the glass. The Futura Range dispenses cold, sparkling and ambient water and comes complete with cup-holder. Ideal for offices with its elegant lines blends smoothly into any setting. Highly compact and stainless steel package. SIMPLY THE WORLDS SMALLEST COOLER ON THE MARKET! Warranty: 1 years parts & labour.